Cyndi: My college roommates want to have a reunion in Utah on the weekend of September 9th. Could we make a trip that weekend? Cyndi: Did you find a marathon yet? Blake: Two. How’d you know? And that’s how I ended up signing up for the Big Cottonwood Marathon. I had thought about doing Big Cottonwood before, so I was happy that things fell into place to do it this year. Besides, I didn’t have any big races to look forward to after the Boston Marathon, so it was nice to sign up for this one. This would be my 17th marathon (18th counting the 50k). 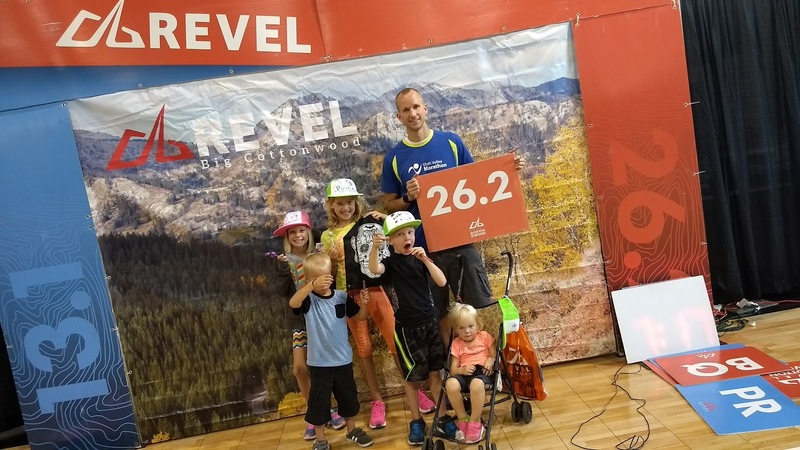 Big Cottonwood Marathon is one of Revel’s races. All of their races have one thing in common: Gigantic downhills. Big Cottonwood is no exception. The full marathon has a net elevation decline of 5255 feet. It starts just under 9700 feet and follows a canyon down into the city. There are two relatively short out-and-backs during the course, but otherwise it’s pretty much just running down the canyon. We arrived in the valley on Friday afternoon and after visiting my grandmother we headed to the expo. The expo was well done. Getting my number and packet was efficient and easy. They had an area to exchange shirts for a different size. There were a bunch of booths to entertain my kids with free stuff. And there was a nice place to take photos at the end. We checked in to our hotel and went swimming with the kids before Cyndi went to the first phase of her reunion and I put the kids and myself to bed at about 10pm. I had gotten a full 8+ hours of sleep on Thursday night, so I wasn’t too concerned about sleeping well. That was fortunate, since Cyndi got back to the hotel at about 1am and after that I tossed and turned until it was time to wake up at 4am. I ate my peanut butter honey sandwich and started drinking my Gatorade while getting ready to catch the bus. Cyndi drove me to the bus and I hopped on. I chatted with a lady on the way up. It was her first marathon, so she was excited. I was too. I think the bus dropped us off at the Big Cottonwood Marathon start area around 5:30am. That gave me about 1.25 hours to use the Honey Bucket a couple times, relax, and get ready to run. I was anticipating a very cold wait for the start so I was well prepared with warm clothes. It turned out to be about 45 degrees, so really not too bad. I never really got cold. We were right on top of the mountain. The marathon would go down the west side of the mountain and I could see a town in the distance to the east. I made my way to the start line and we were off right at 6:45am. 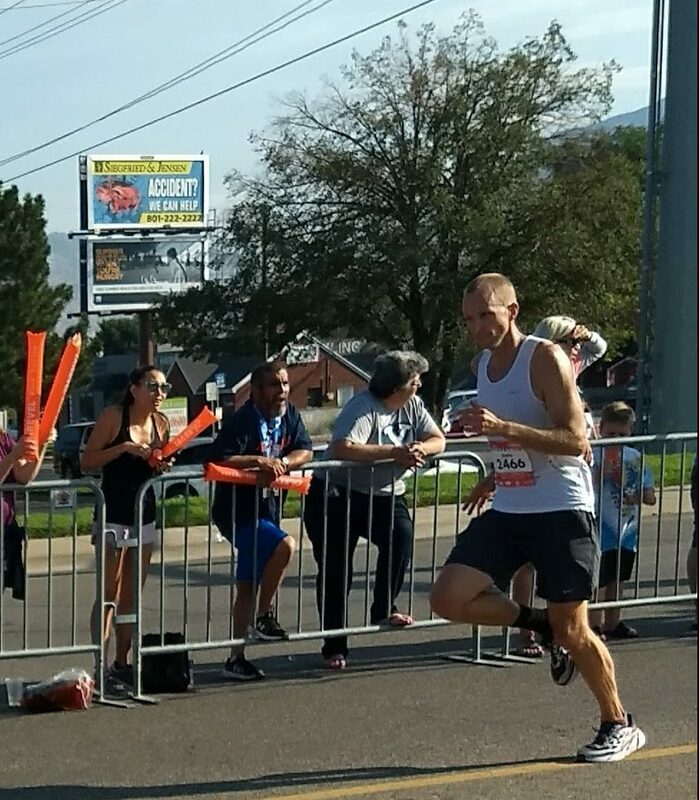 No, I’m not lying: My first three miles of the Big Cottonwood Marathon were all under 6 minutes per mile! Not because I have some new secret training regimen, but because it was blistering downhill. My Garmin captured elevation losses of 497 ft, 256 ft, and 299 ft for the first three miles, respectively. During the first mile, I turned to a guy near me and said, “Wow. This is really steep.” A little while later I asked him what time he was going for to make sure I wasn’t out of my league. He said he was shooting for “2:40. 2:38.” I didn’t plan on finishing that fast, but I didn’t feel like I was killing myself yet. He actually ended up winning. It was really nerve-wracking to be breaking 6 minute miles. On the one hand I didn’t want to burn myself out by starting too fast (been there, done that). On the other hand, I didn’t want to fight the downhill, as that would just wear down my quadriceps even faster. So I tried to stay relaxed and make sure my breathing was under control. After finishing mile 3 the course does a short loop near Brighton ski resort. There’s a little uphill section on this part of the course, so I was careful to slow down and take it easy. After screaming down the first three miles, it was hard to slow down and not go fast up the hill. Fortunately I knew it was coming and had planned ahead. A few other runners caught up to me and some passed me, but once we made the turn and started heading back down I passed them right back. I figured I was around 10th to 15th place at this point, but I was actually something like 7th or 8th. This little section reminded me that I was running around 9000 feet elevation. I could feel a little shortness of breath and lightheadedness. I was happy that we were quickly descending into thicker air. The downhill continued and I got into a nice rhythm. 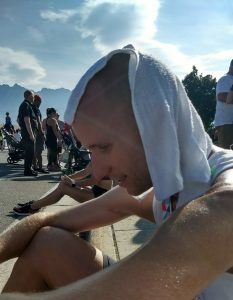 I started doing the math and realizing that I had a good shot at a PR and potentially even breaking 2:50:00 for the first time. However, I was very concerned that this downhill would destroy my quads and I would fall apart at mile 20. 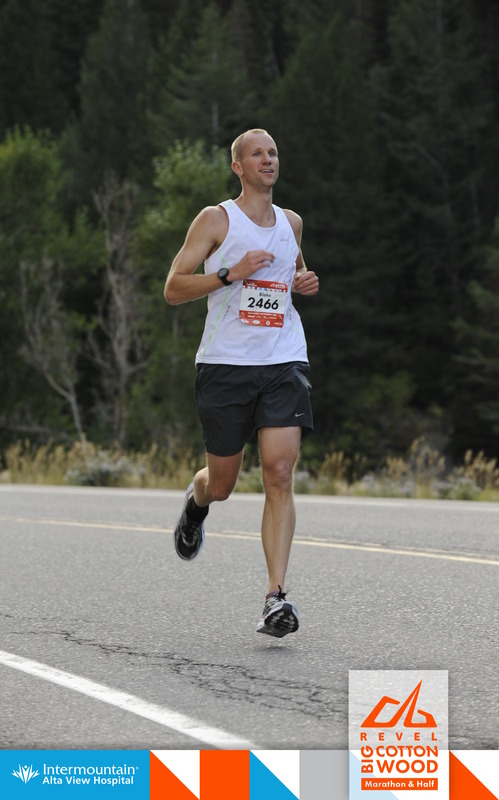 I knew this happened to a lot of runners in previous Big Cottonwood Marathons and in similar downhill races. Moreover, I was very uncertain of my pace. I continually self-assessed to make sure I was staying relaxed and not spending too much energy, despite the fast pace. I had my Garmin 235 on, and through much of this section it was telling me that my heart rate was over 170. I really didn’t feel like it was that high, although I knew that it’s tough to tell in the middle of a race. I expected and wanted a heart rate in the low 160’s. A few of these miles weren’t quite as steep, so I slowed my pace a bit to compensate. Again I could feel the elevation a bit. I made sure to get enough liquids and I was refueling on Jelly Belly Sports Beans (courtesy of my sister-in-law who got them for free) and my traditional Honey Stinger Waffle at mile 10. About this time we also passed the Big Cottonwood Half Marathon starting line and volunteers were busy picking up Mylar blankets. At mile 11 I finally caught up to a guy in a red shirt that I had been following throughout the race. He was breathing really hard. I almost told him that he was breathing too hard and he needed to take it easy, but I wasn’t sure that would be appropriate. So I said “good job” and moved on. I looked him up after and found that he bonked at mile 19 and finished about 13 minutes behind me. I know how that goes. The course started getting steeper again after mile 11. It also had some fun curves to run around. And the views were spectacular. The amazing views actually started at the beginning. There were some impressive rock faces and cliffs that towered above us puny runners. There were several sections that had avalanche warning signs and I could see why: on one or both sides of the canyon there were steep mountains that rose high above the roadway. I had to remind myself to look around and enjoy the scenery every once in a while and I’m glad I remembered to. There was also a creek along much of the course and I could hear the water rushing down the canyon. The vegetation was plentiful, green, and refreshing. 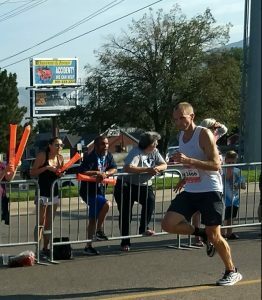 I crossed the half around 1:22 and realized I’d need a 1:28 to break 2:50. I didn’t know if I could do it, but I was curious to try. I knew I still had some serious downhill to bank more time. Around mile 14 I noticed that my right quadriceps were really tight and getting sore. Once again I worried what would become of me when I exited the canyon. We started passing the half marathoners. There were lots of them, but since we had a whole lane to run in there was plenty of room and it wasn’t a problem. I said “good job” to many of them until I started to get too tired. At this point I had maybe one marathoner in my sights, depending on the turn. I didn’t look back so I wasn’t sure how close the next runner was behind me. I just kept running my own race and trying to prepare mentally for the flatter last few miles. At mile 18.5 the marathon course turned right while the half marathoners continued straight. There were finally some spectators now that we were out of the canyon, and that was a nice boost. Some of them were excited to see marathoners since it had mostly been half marathoners coming through so far. After the turn the course flattened out. I was bracing for The Wall, but it didn’t come! Instead, it felt quite nice to run on flat terrain and even a little uphill. This was a turn-around section, so I began scanning the other side of the road for the first runners. I didn’t see them come through until just before mile 20, which meant they were only one mile ahead of me! That made me really happy as I expected they would be a good 20 minutes ahead. My stomach felt about how you would expect a stomach to feel after 20 miles, but I forced down a Gu and some water and Gatorade. The sun was out now so I started dumping water on my head as well. I counted 6 people ahead of me, but when I made the turn I saw what seemed like 50 runners right behind me! 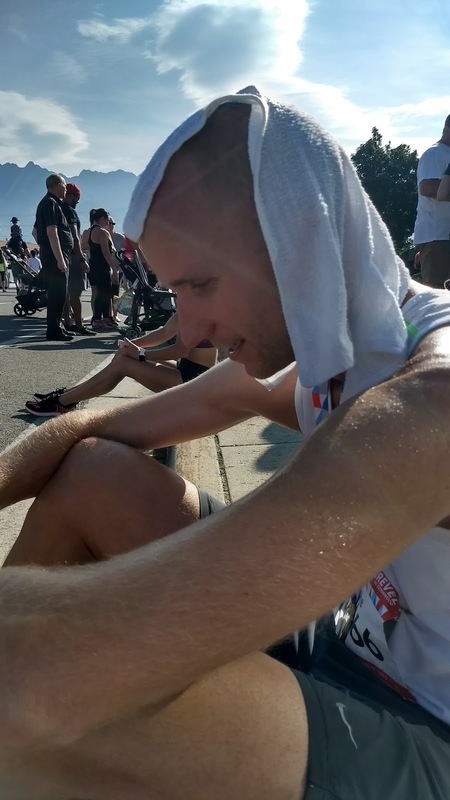 I still tried to focus on my own race, but now I was running scared and I tried to dig a little deeper so I wouldn’t drop from 7th to 30th over the last 5 miles. Sure enough, I soon heard footsteps. There was a cruel little hill during mile 23 and a guy passed me near the top of it. He was 49 years old and I immediately had a lot of respect for how strong he was running at this point. The guy that passed me provided a nice benchmark to measure myself against during the last 5k. He slowly pulled away, but his strength gave me a little extra encouragement. Mile 25 had a steep downhill and it hurt. My legs were now in full rebellion. Happily, I wasn’t in total meltdown mode like I have been many times before at this stage of a marathon. That said, I was counting down every step until I could stop. I continually did pace calculations to figure what I needed to do to break 2:50. This kept me pushing to keep the pace as close to 7:00/mile as possible. I could finally see the finish line with about 0.6 miles left. I was slogging and just trying to get there. There was a great crowd at the finish which was nice. I looked for Cyndi but couldn’t find her. Suddenly with about 100 yards left I saw another marathon come up to my left trying to pass me! I put on a burst of speed that I didn’t know I had and raced to the finish line. I couldn’t believe that was left, and I was a little chagrined that I was apparently slacking off for the last mile. Because I saw this guy. 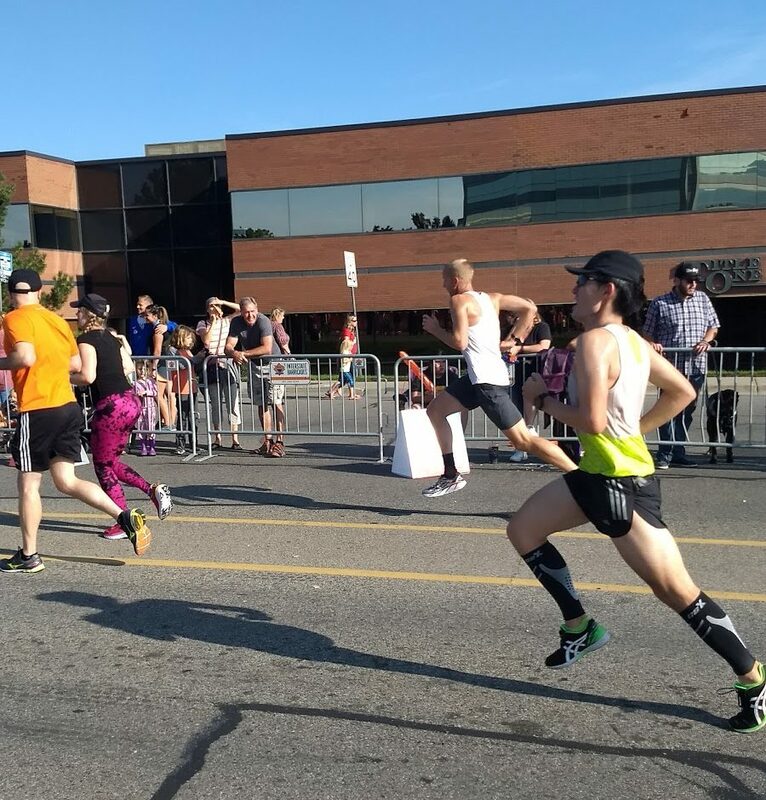 I only wish that runner would have challenged me about 50 yards sooner as I might have finished 2 seconds faster, but I ended up with 2:49:01, which made me very happy! That was an 8 minute PR. Cyndi was at the finish and found me pretty quickly. She was excited and congratulatory for my good race. Apparently I miscounted, because I ended up getting 6th overall and 1st in my age group. That definitely exceed expectations. They had pizza from Papa John’s, soda from Sodalicious, and protein pancakes at the finish. An excellent selection of food. They also gave us wet rags which I placed on my head for a good 20 minutes. My body hurts. Just let me sit. After the race I sat in the hot tub at the hotel (I know it’s a sin after a marathon but it felt so good) and swam with the kids a bit. Then we had some delicious Kentucky Fried Chicken, because when else can I justify extra crispy KFC? Then we had some amazing ice cream at Leatherby’s after playing at a park with Cyndi’s roommates’ families. 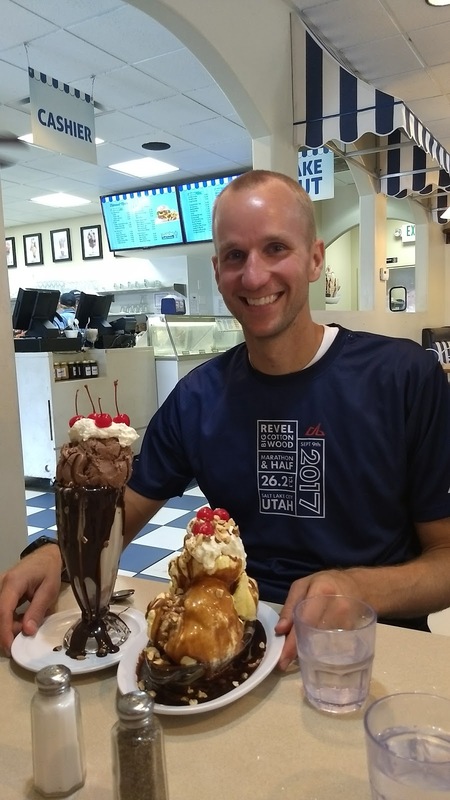 Getting some delicious ice cream at Leatherby’s after the race. Don’t worry, I shared with my kids. Revel knows how to put on a good race. 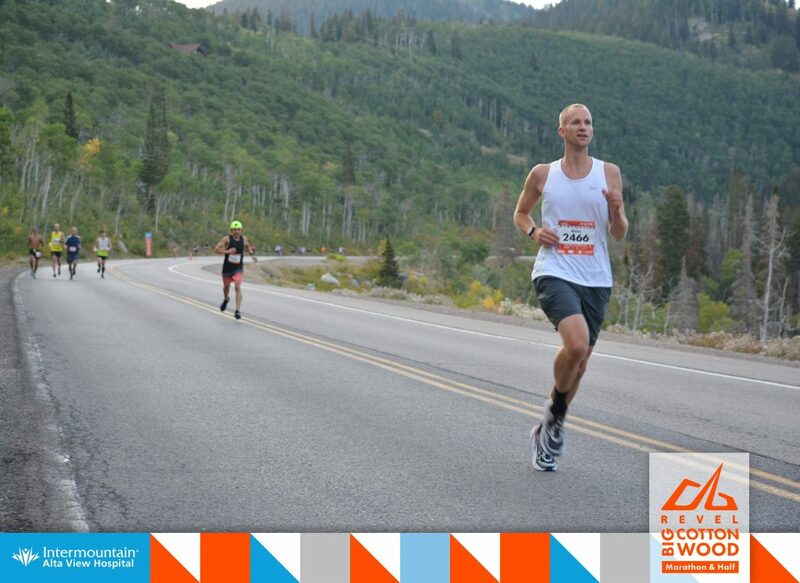 The Big Cottonwood Marathon was fantastic. The organization was superb. The course was fast and scenic. The aid stations were well stocked. The website results and (free!) photos are best-in-class and were up within 48 hours. I emailed them for a couple of different things and received responses in under 12 hours. I had a great experience and I hope to run another one of their races soon.